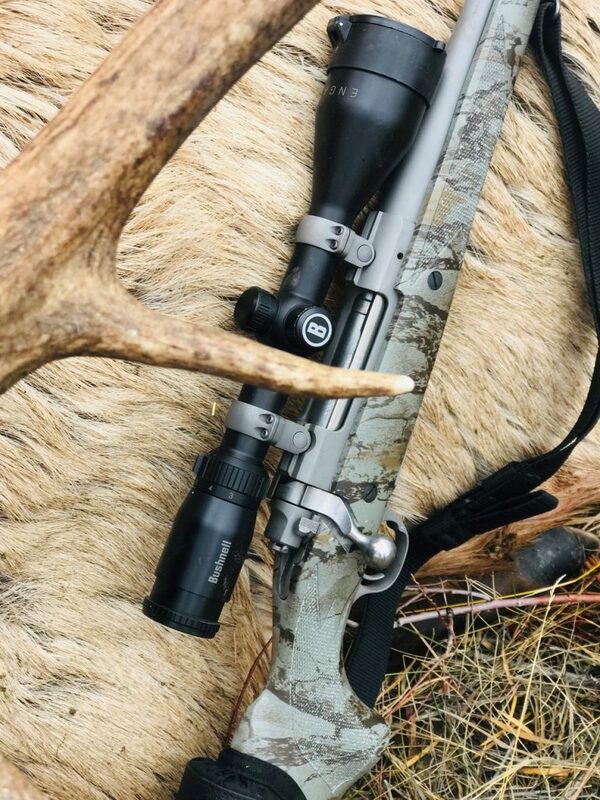 Hunting elk on public land is not easy. It is by far the most demanding hunting I’ve experienced to date. 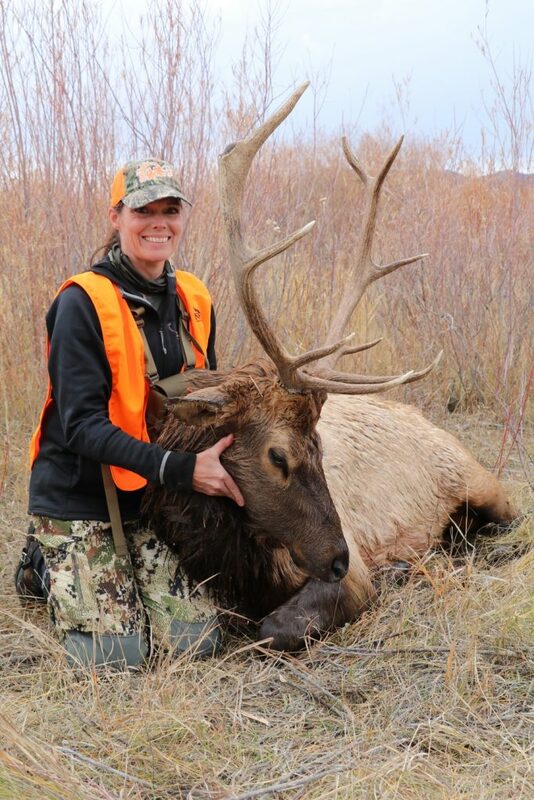 The elk just won’t cooperate, and they do not live on a schedule. Native Americans called elk Wapitiand referred to them as the ghost kings of the high country; meaning they hide, so you must hike all over to find them and then go to them. It seems easy, but you can’t just take a direct route to them … nope, you must read the wind, and often hike beyond where you see them, to come in with the advantage of elevation and surprise. The elk hunts I’ve been on in Montana average hiking 8 to 10 miles daily; climbing steep grades that seem to be straight up at times; leaving well before daylight and returning well after sunset; enduring weather conditions from freezing cold, scorching heat, thunderstorms, snow storms, wind storms, dry or muddy ground; and walking in all kinds of terrain from grass fields/parks, to mountain peaks and everywhere in between. For 6 years, I’ve put in the work. 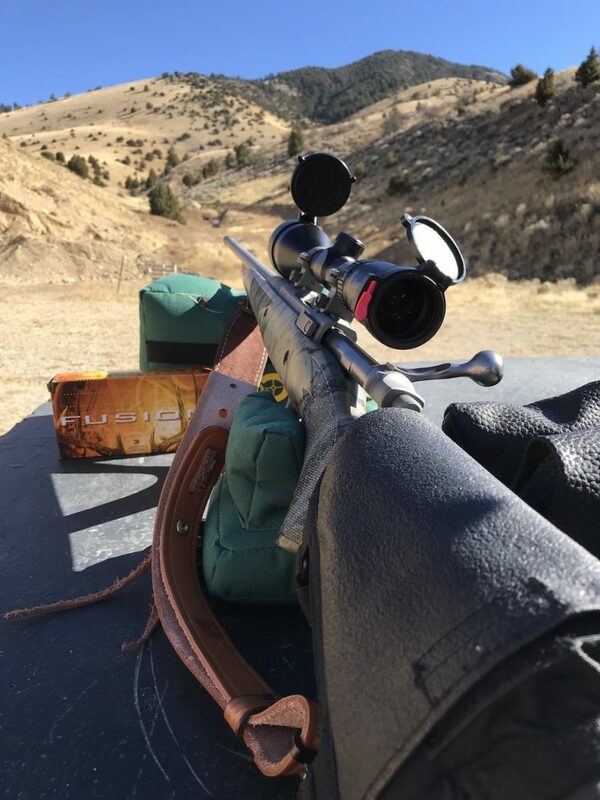 This year, I was unable to archery hunt; so, I took a rifle, a Ruger Hawkeye FTW Hunter, 300-Win Mag and a Bushnell Scope, the Engage in 3-9×50, that provided clarity at a longer shot. For ammo, I chose Federal’s Fusion line. This rifle was extremely light and had way more range than my bow. 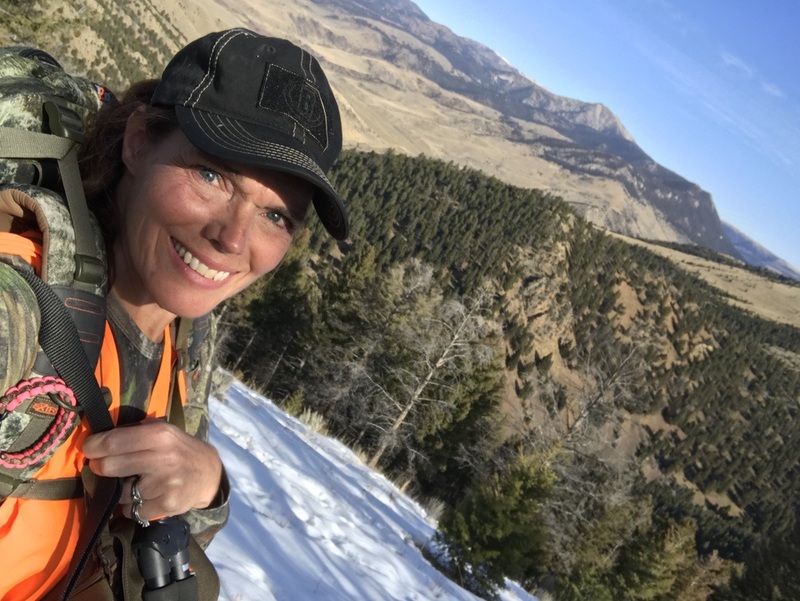 One of the things I look forward to most during an elk hunt, is sitting on the side of a mountain, with one of my best friends, Donna McDonald. Donna owns Upper Canyon Outfitters; she and her husband, Jake, have welcomed me year after year as I continue my quest to harvest an elk. This year, Donna was convinced I would get a bull. I wasn’t so sure, but I had my hopes up. On the first day of hunting, I set off with my guide, Rocko. I was eager to get out and hunt, and the laziness in me wanted to get it done day #1, so I could relax a few days before heading home. This is probably the least prepared I’ve been for hunting Montana. I normally will begin building up my strength and endurance to handle the long hikes; however, this year I barely got on the treadmill once a week. I would love to blame my schedule, but the truth is I didn’t prioritize exercise – big mistake! Right out of the gate, we started our climb. It was dark, and that saved the mental debate I normally have with myself as we climb from the bottom to the top of a mountain, with it’s always just a “little bit more.” It was so amazing to be at the top of a mountain and see the sun peek over the horizon and light up the mountain tops to the west of us. The scene was absolutely beautiful and took my breath away … or was that because I was lacking oxygen from being out of shape? This was opening day of rifle season, and very different from opening day of archery season. I have never seen so many hunters. Orange dotted the landscape and made it difficult, especially when we had a hunter come and set up in the middle of where we were hunting. It was “game over” that day, because we could not have taken a safe shot at an elk. I am amazed that there isn’t a “hunter’s etiquette” guide, because we got there first, so in my mind we had dibs. That morning we saw 5 moose, and a couple of cow elk. We headed down after sunset, and the hike down was much easier than the hike up. Day #2 came earlier than I expected, but I eagerly got up to head back out to get an elk. We had a plan; so Rocko, Keren (a newer guide) and I headed out and up. We started out the morning on an easy hike to a point that looked across a mountain range at no more than 400 yards for a nice shot. We were there; the elk were not. So, we moved on. The guide wanted to get to a lookout point to have lunch, get some rest and hopefully find some elk to make a plan. On the first day, my body was in shock. It was saying to me, “What the heck is happening here, but OK let’s move.” However, on the second day, my body was shouting, “Oh, heck no!” but my mind overruled and we pushed through. Honestly, this is where preparation for the hunt or my lack thereof really hindered my chances for success. As soon as we sat down at the lookout point, Rocko spotted an entire herd of elk, sunning themselves on the peak of the mountain within hiking distance. I ate fast, the adrenalin was pounding; and when we started a brisk hike toward what seemed an impossible climb, my body doubted its capability and my mind was buying in. The day was very hot, and I started out in layers of Sitka gear, and my rapidly consumed lunch, coupled with the heat was not a good combination. I asked the guide to stop, and I quickly took some layers off. Rocko and Keren were strategizing a plan … a difficult plan. Plan #1: One course of action was to climb all the way down the mountain we were on, and then all the way back up the other mountain. This course of action had risk, the elk would surely notice us on a direct approach. Plan #2: The other option was to climb to the very top of the mountain we were on (we were pretty close), and then skirt around to the other mountainside so we could sneak in. There were risks with this option, too. The mountainside was covered in shale rocks, or as I like to call them, boulder mine fields. The entire time, I was telling them that I honestly felt I couldn’t make it from point A to point B in such a short amount of time as we were racing the sun. As luck would have it, or not luck since the goal was to hunt an elk, as we deliberated the elk got up and moved. We would have missed them anyway. The good news is that they started bugling. An elk bugle is one of the most amazing sounds to hear; and they were screaming their fool heads off. As we watched, spike bull after spike bull move around, suddenly the grand daddy appeared. We decided to hunt our way back down and see if we could intercept them as they might be headed to a stream for water. Once again, they did not cooperate. Day #3 came faster than any other day, and I was extremely excited because Donna was going out with Rocko and me. I was totally excited to sit on the side of a mountain and catch up. We started out the day hunting the same range as the morning before. Once again, no elk nearby, but Rocko spotted them in the exact spot they were the previous day. We made a plan and started our hike. Straight up the mountainside we went. I felt great, though tired, my body and my mind had acquiesced to the reality that we were doing this. Donna had a hurt knee, and she still out-hiked me. We hiked all the way to the top of the mountain we had seen the elk on the day before. I had the biggest sense of accomplishment to reach a spot where honestly not 24 hours earlier, I thought I physically and mentally could not reach. Victory was mine, but there still were no elk. They were gone. The elk dropped on the backside of the mountain again, and we ran toward it. Once again, he reappeared, and I took another shot. I hit him in the leg with the second shot, and totally missed on the third shot. I had guessed he was now 400 yards away; in fact, he was 120 yards away; so, I shot over the top of him. We started sprinting up the mountain. My body and my mind were not thinking in terms of “I can’t,” but instead I was like a 5-year-old whose grandma gave him too much candy. We scaled to nearly the middle of the mountain before we heard Donna saying, “Come on!” Having spent her life on these mountains, Donna wanted to get around the mountain for a better vantage point to see where the bull went. The leg shot actually helped identify him, because he was limping, and the elk was seen going onto private property. He was headed toward a herd of elk, but suddenly he broke away from them, and was staggering back and forth in the middle of a field. 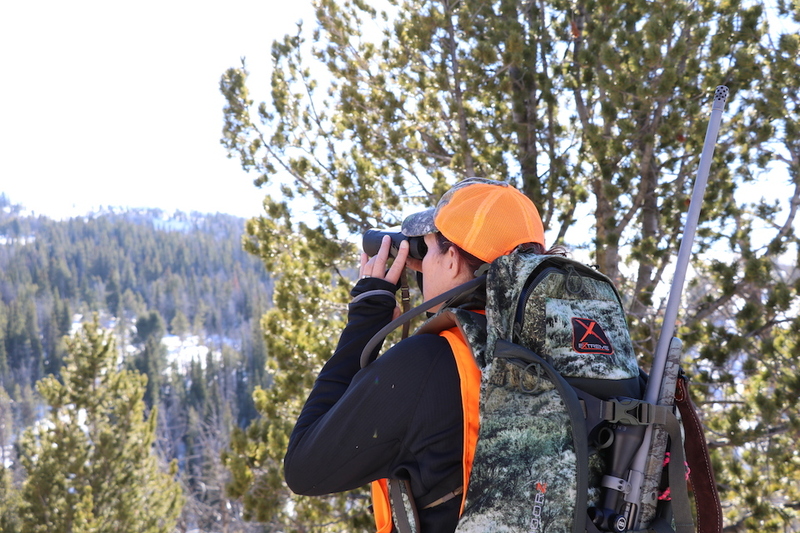 We had 2 factors to consider that night; we had to request permission to go on the property, and the private land had hunters on it, who might see and shoot my elk. At first, I thought, “Well, that stinks,” but a friend explained it to me. He asked, “Karen, if you were hunting and saw a wounded animal, would you let it suffer or would you take it?” Well, every hunter I know would do the right thing and take it. The other thing that had completely escaped me, as I was hoping to get on the private land, was that it had turned to night. Even if we got on the land, if I needed to take a shot, it was well past shooting light. Jake called and got us permission to go in the next day, but not until after 10 in the morning, because they had hunters hunting there. Back at Upper Canyon, I was exhausted. I felt a sickness in the pit of my stomach, repeating the day’s adventure and hoping the animal would be there in the morning and not be suffering. I ate a good dinner and fell asleep pretty quickly. Sleep didn’t last long, at 12:30 a.m., I woke up, worried to death about the outcome of this hunt. I did not want my hunting to be over, and I certainly didn’t want to lose an animal I had shot. I struggled to get my mind in the middle, and then an overwhelming urge came over me to pray. I pulled up my phone and read Bible verses on worry and faith. I prayed that God would not let the animal suffer, that we would find him, and that no matter what the outcome, I would be thankful. Then I started wondering, what do elk do when they are shot? I started reading articles published by Outdoor Life and by our sponsor, the Rocky Mountain Elk Foundation, on elk hunting. I found one written by my friend, Dr. Wayne VanZwoll. He wrote that elk were some of the toughest creatures. He stated when shot, elk will flinch (Rocko had told me the elk did that), even with a good shot, elk might circle back and look at you, wondering what just happened (This elk did that, too. ), and he pointed out that an elk about to expire will separate themselves from the herd (This elk did that, too.). I felt confident that we would find the bull the next morning. I still didn’t sleep much that night. The next morning, Rocko and I were out at sunrise, glassing the field on private land. I felt like it was my duty to keep looking the only way we could at the time. When 10 a.m. finally came, we entered the private property. We walked a long way down a fenceline, looking for any sign of the elk. We found nothing. I walked off to the other side of the fence. I was getting discouraged, but the Bible readings came back to me. I prayed to God again, and I promised I would be thankful – no matter what the outcome. I think that is the hardest thing to do, is to praise God when times are tough, but that is the true definition of faith. In all honesty, keeping things in perspective, this hunt is really not tough at all. I felt truly thankful. I walked back to Rocko. Jake and Donna had come to help look. Rocko told me to get in the side-by-side with Jake and go to the opposite fence line and look for sign. We started off, and not 20 feet in, I shouted, “Stop, stop, blood, blood, blood!” We found the blood trail. Rocko, Donna and I started following it. The bull elk had wound around, jumped a fence and stopped at a river. Rocko stayed on the bank, as Donna and I went to the other side of the river, so we could see where the trail last was. As we worked our way around, Rocko said he thought the elk was just ahead of us. Donna and I worked our way to the river. I wish I had a picture of this, because the elk was standing in the middle of the river, so magnificent, the fall leaves on the trees behind him, and the clear water around him. Donna told me to shoot him, and I did. After hunting elk for 5 previous years, my immediate thoughts were not of joy. 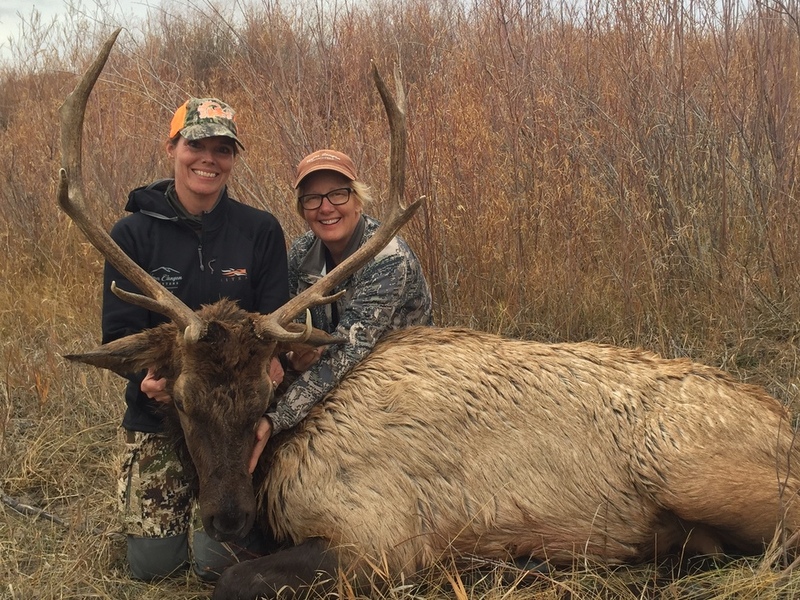 Rather, an appreciation and sadness for the animal swept over me, and I thanked the elk and God for the experience, for letting me share it with Donna and for the harvest. Finally, I have provided elk meat for my family. Read more adventures by Karen Butler and team members of Shoot Like A Girl at its website.